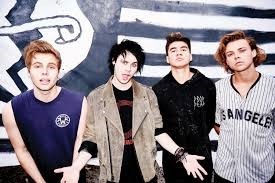 LOS ANGELES — 5 Seconds of Summer were already in shock when their album beat out Beyonce and Jay-Z for the top spot on the Billboard 200 chart this summer. But having their single “Youngblood” reach the No. 1 spot on the pop songs chart and become an international smash hit has the band in awe. The band’s impressive year kicked off when “Youngblood”, also the title of their latest album, outsold Beyonce and Jay-Z’s “Everything Is Love”, giving the band their third No. 1 album on Billboard’s 200 albums chart.